[QODBC-Online] Troubleshooting - QuickBooks Online - QODBC Requires API version 1.1 or 2.0 to communicate with QuickBooks. Troubleshooting - QuickBooks Online - QODBC Requires API version 1.1 or 2.0 to communicate with QuickBooks. 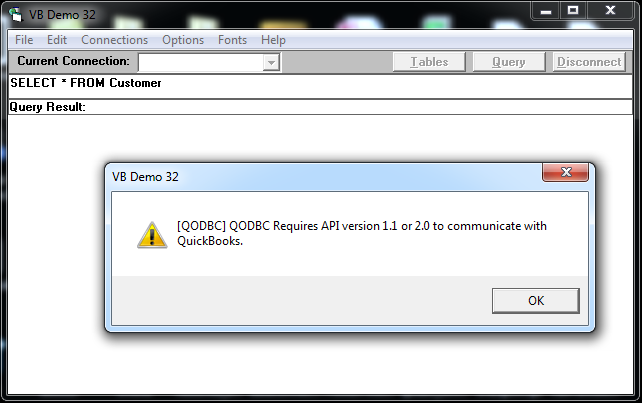 I was able to use QODBC Online with my QuickBooks Online (QBO) but suddenly I facing connection issue. We have reference to the above URL and as the URL is down, QODBC Online is unable to complete the connection. We have reported this issue to Intuit. Intuit is working on fixing the issue. At this moment, we do not have any ETA. We are working with Intuit and will post the update on this page as soon as the URL is fixed. 2015-11-25 15:43 (Eastern Time) : Fixed. Intuit website services - http://apps.quickbooks.com/dtds/qbxmlops60.dtd is UP & Running. You should be able to use QODBC Online. So far this process has only been frustration. Test connections should work from QODBC Online Setup Screen. Test connection may not work from QODBC Data Source Manager --> QODBC Online Setup Screen. This is because when running from ODBC Manager, the setup screen runs as Elevated permission.